We love the Nest Cam IQ — a lot — but $300 is a lot of money to spend on one home security camera. Even right now while it’s discounted on Amazon, it’s still very expensive. 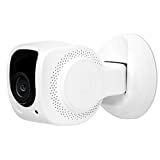 If you’re looking for a camera with the Nest Cam IQ’s awesome new facial recognition and face-tracking feature but $260+ is outside your budget, definitely check out the Lynx Indoor 1080P Wifi Home Security Camera with Night Vision and Facial Recognition. This nifty camera packs the Nest Cam IQ’s signature feature into a $60 device, and it even includes free 7-day cloud storage for life!